Captain Worthington is injured in the battle of Trafalgar. Blinded by shrapnel, his life goes from being at the forefront of society to being almost cast off. He finds himself sitting with the wallflowers at a ball - something he doesn't take too kindly to. Miss Amelia Basingstoke has no dowry and enough dreadful relations to ensure that even on her third season, she is unmarried and a confirmed wallflower. Her only friend is a large boisterous dog of dubious character who considers himself too good to chase dead birds. A chance meeting between the pair frees the captain in ways that he had never thought possible since his injury. A stubborn captain, an opinionated young woman, an unruly dog, and Christmas is approaching - what could possibly go wrong? This is a lovely, sweet and romantic Regency romance. There are so many wonderful scenes in this story. The initial meeting between Amelia and the Captain at the ball was sweet and funny. Both of them were left sitting and ignored in the wallflower's area and they exchanged humorous quips about it. Amelia is a nice character who speaks her mind. She is unfortunate in her relations who are unkind to her. I loved the role that Samson, the dog, played in bringing the pair together and his presence added humour. The Captain is very fortunate in having a very good friend who helps him get around and I'm hoping there is a story being written for him. This is the fourth book I've read and enjoyed by the author. 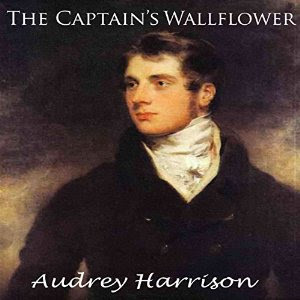 Audrey Harrison writes very good, clean regency romances and she is an author I can recommend to family and friends who are fans of the gene. for more information about her titles. I received the audiobook in exchange for an honest review.